Mini has collaborated with Italian car tent specialist Autohome to create a new product for the Countryman crossover. 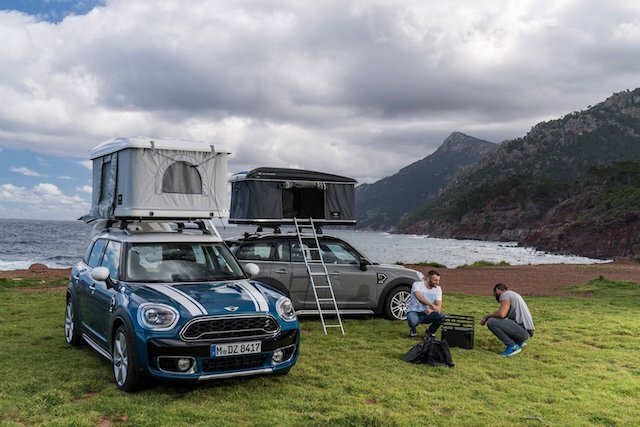 To show the Mini Countryman's versatility and outline its four-wheel-drive credentials, Autohome worked alongside the Mini design team and has created the special edition AirTop roof tent. The 2.1 metre long tent can be mounted on a Countryman's roof without the need for any tools and is available now as a £2,397 optional extra. It enables customers to use the car's roof as a base for their tent and camp up top. The tent sits inside an aerodynamic, fibreglass roof top box for easy storage. When it's time to use the tent, the owner simply releases some catches before four gas struts allow the tent to open into position. An aluminium ladder can be used to climb inside. It extends upwards to over 94cm in height and can accommodate up to two people. luggage nets inside to store all of your smaller items such as toiletries. Mini also claims the AirTop has outer walls made of high-quality fabric, which helps contain heat and insulate you from outside noise. The AirTop will only be available in two colour options of black or white. This is to match the colour options of the roof and exterior mirror caps on the Countryman.